Black Catholics comprised a significant portion of the American Catholic community at the time of the American Revolution. 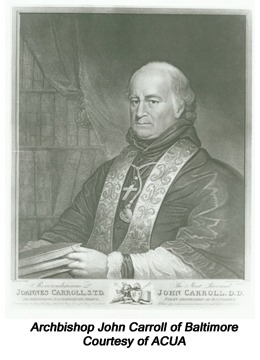 Soon after Pope Pius VI named him superior of the mission church in the newly established United States of America (1785), John Carroll reported to Roman authorities that approximately three thousand Catholic African slaves lived in the state of Maryland alone, with some residing in Pennsylvania as well. A slave owner himself, Carroll permitted two of his slave women to serve as baptismal sponsors for both black and white infants and willed that his manservant, Charles, be given to one Daniel Brent on the condition that Brent manumit Charles within a year of Carroll's death. Carroll was not alone among the American Catholic religious in owning slaves. In the State of Maryland, the Society of Jesus owned a large number of slaves who worked on the community's farms. Realizing that their properties were more profitable if rented out to tenant farmers rather that worked by slaves, the Jesuits began selling off their slaves in 1837. We say distinctly that we are strongly opposed to all efforts made in the non-slave-holding states to abolish slavery where it legally exists. . . . We do not agree with the abolitionists that slavery is malum in se [evil in itself], and that one cannot with a good conscience be a slave-holder. . . . As a general rule, we believe the slaves are treated with kindness and humanity, sufficiently fed and clothed, and not over-worked. During the first years of the American Civil War, American Catholic bishops continued to voice opposition to abolitionism, often exhibiting openly racist attitudes. In 1861, Archbishop Hughes of New York wrote in The Metropolitan Record that by making Africans slaves, Europeans and Americans had saved them from the "butcheries prepared for them in their native land." The Irish-born Hughes also thought abolition smelled too much like an English plot. Although they clash with modern perceptions of civil and human rights, proponents of nineteenth-century Catholic views on race and slavery grounded racist arguments in Biblical passages, pronouncements of various Church councils, the writings of various Church fathers, including Ignatius of Antioch, Gregory of Nyssa, John Chrysostom, Augustine, Thomas Aquinas, and a number of Papal statements, including Pope Paul III's Sublimis Deus (1537) and Gregrogy XVI's In Supremo (1839). Many American Catholics supported proslavery positions with the claim that Jesus frequently used masters and slaves in his parables without condemning the institution of slavery itself. Saint Paul, in his writings, supported the rights of kindly masters to the obedient service of their slaves. Others argued that slaves were rational humans who, by possessing souls, should be permitted to marry and develop a stable family life. Along with food, clothing, and proper housing, masters had the duty to provide their slaves with religious education and the ability to practice their faith. We warn and adjure earnestly in the Lord faithful Christians of every condition that no one in the future dare to vex anyone, despoil him of his possessions, reduce to servitude, or lend aid and favour to those who give themselves up to these practices, or exercise that inhuman traffic by which the Blacks, as if they were not men but rather animals, having been brought into servitude, in no matter what way, are, without any distinction, in contempt of the rights of justice and humanity, bought, sold, and devoted sometimes to the hardest labour. . . . We reprove, then, by virtue of Our Apostolic Authority, all the practices abovementioned as absolutely unworthy of the Christian name. By the same Authority We prohibit and strictly forbid any Ecclesiastic or lay person from presuming to defend as permissible this traffic in Blacks under no matter what pretext or excuse . . .
"When the slave power predominates, religion is nominal. There is no life in it. It is the hard-working laboring man who builds the church, the school house, the orphan asylum, not the slaveholder, as a general rule. Religion flourishes in a slave state only in proportion to its intimacy with a free state, or as it is adjacent to it." Though verbally and physically abused within the church, African-American Catholics slowly began to establish religious organizations and orders in the first half of the nineteenth century. In 1829, Mary Elizabeth Lange, who was born in Cuba of Haitian parents, founded the Oblate Sisters of Providence in Baltimore, Maryland. Soon after receiving papal approval, the Oblate Sisters established a number of schools and orphanages for African-American children. Thirteen years later in New Orleans, Louisiana, Juliet Gaudin and Henrietta Delille founded the Sisters of the Holy Family. The next year, 1843, saw members of Baltimore's Haitian Catholic community gathered to establish the Society of the Holy Family, the first African-American lay organization in the United States. Unfortunately, the society was short-lived, disbanding after two years, partially because members of the Archdiocese of Baltimore refused to let the society hold meetings in Calvert Hall, a building owned by them. Although African-American Catholics began establishing lay organizations and founding women's religious orders, an essential element of religious legitimacy and satisfaction eluded them: clergy from their own community. While there had been African-American Catholics around since before the founding of the United States, historically only white priests tended to their spiritual and corporal needs. Though the Vatican promoted the importance of African-American priests, the American hierarchy, exhibiting commonly accepted racial attitudes, considered African-Americans poor prospects for the priesthood. These attitudes forced the first African-American priests to pursue their formational studies and ordination outside of the United States. 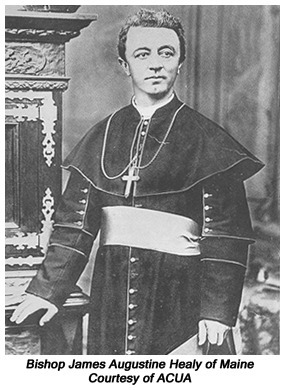 One of six siblings, five of whom took religious vows, the first African-American priest, James Augustine Healy, a light-skinned son of an African-American mother and Irish-immigrant father, was ordained in 1854 in Paris, France. Father Healy went on to become the second bishop of the Diocese of Portland, Maine in 1875. His brother, Patrick Francis Healy, joined the Society of Jesus (Jesuits) in Liege, France in 1864 and became the president of Georgetown University ten years later. A third brother, Alexander Sherwood Healy took on his vocation in 1858 in Rome, Italy, but his career was cut short by an early death. The Healys' two sisters, Josephine and Eliza, respectively joined the Religious Hospitallers of Saint Joseph and the Congregation of Notre Dame. Eliza later became the convent superior.